EghtesadOnline: Non-oil trade with the BRICS nations during the last fiscal (ended March 20) declined 8.68% in volume but increased 7.4% in value compared to the year before to stand at 53.82 million tons worth $29.08 billion, Financial Tribune’s data analysis based on the Islamic Republic of Iran Customs Administration’s statistics show. BRICS is the acronym for an association of five major emerging national economies, namely Brazil, Russia, India, China and South Africa. Iran exported 45.3 million tons of non-oil goods worth $12.16 billion to the five nations under review last year, registering a decrease of 5.89% in tonnage and an increase of 5.44% in value, while imports stood at 8.48 million tons worth $16.9 billion down 21.18% in tonnage and up 8.91% in value y/y. Iran exchanged $101.23 billion worth of non-oil goods with other countries in the March 2017-18 fiscal, up 15.5% compared to the year before, according to IRICA. Exports during the period hit 132.3 million tons worth $46.93 billion, indicating a 6.56% rise as imports amounted to 38.73 million tons worth $54.3 billion, up 24.31% Y/Y. The above figures suggest that Iran’s non-oil trade with BRICS nations accounted for 28.7% of the country’s overall foreign trade last year. Moreover, exports to the select group of countries accounted for 25.9% of overall exports as 31% of overall imports came from the same nations. Iran-China trade stood at 39.69 million tons worth $22.28 billion, down by 5.93% in tonnage but up 16.52% in value Y/Y. 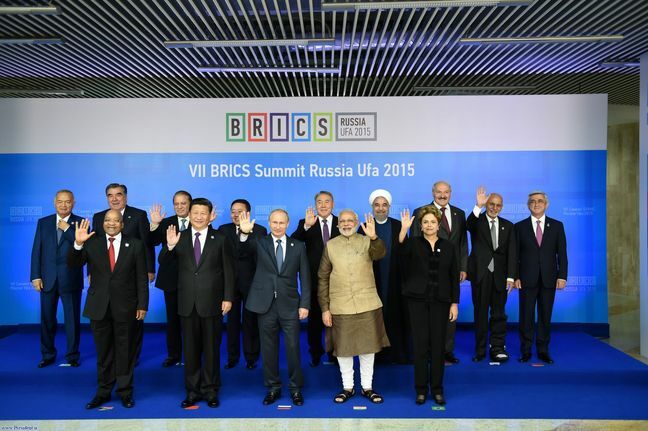 This is the highest value rise in trade with Iran among the BRICS. Moreover, the East Asian nation was Iran’s biggest trading partner last year, not only among the five countries under review, but also globally. Iran exported 34.89 million tons of commodities worth $9.06 billion to China -- a 7.57% decrease in tonnage and 8.31% growth in value Y/Y. Meanwhile, China exported 4.80 million tons of goods worth $13.21 billion to Iran, up 7.92% and 22.91% in tonnage and value respectively YOY. India was Iran’s second biggest trading partner among the BRICS, having traded $4.98 billion worth of 11.57 million tons of non-oil goods last year, up 3.79% and 5.13% in tonnage and in value respectively. Iran exported 9.79 million tons of goods worth $2.73 billion to India, posting a 2.45% increase and a 2.02% decrease in tonnage and value. Meanwhile, India exported 1.78 million tons of goods worth $2.25 billion to Iran, up 3.79% and 5.13% in tonnage and in value respectively Y/Y. Iran-Russia trade witnessed a decrease of 21.83% and 42.14% in tonnage and value respectively to hit 1.91 million tons worth $1.03 billion. Iran exported 540,486 tons of non-oil goods worth $293.52 million to Russia, up 49.29% and 34.06% in tonnage and value respectively YOY. Russia’s exports to Iran stood at 1.37 million tons worth $743.15 million, down by 34.17% and 52.74% in tonnage and value respectively YOY. Iran’s non-oil trade with Brazil witnessed Y/Y decrease of 81.59% and 46.73% in tonnage and in value to reach 554,004 tons worth $703.22 million respectively. Iran’s exports to Brazil stood at 40,432 tons worth $28.43 million down 89.83% and 74.58% in tonnage and value. This is while Iran imported 513,572 tons of Brazilian goods worth $674.78 million, down by 80.34% and 44.15% in tonnage and value respectively. South Africa came last as trade with this country totaled 82,114 tons worth $74.5 million last year, registering 35.38% and 19.78% drop in volume and value respectively. Iran exported 75,397 tons of goods worth $40 million to South Africa, down 32.29% and 6.72% in tonnage and value, while South Africa’s exports to Iran stood at 6,716 tons worth $34.24 million, indicating 57.25% and 31.13% decreases in volume and value respectively.